This is a book I read about a decade ago. It is a science fiction type book and I got it in the young adult section of my public library. It is a standalone book, not a short story or collection of stories. The main character of the book is a youngish woman, I'm guessing younger than 30, but I can't remember her name. One of the other major characters/possible love interest is a man named Garth (I remember this name in particular because I had never heard of anyone named Garth and thought it was funny). They meet up with others along the way, somewhere around 10-20 people in total. Once the main character meets up with other transported humans, they start trying to figure out what to do. They receive some sort of instructions from the aliens who put them there and they are told if they reach a certain place alive, they will be sent back to Earth. A lot of the conflict centers around people arguing whether or not to follow the instructions they were given. The aliens themselves don't play a huge role until the end (other than giving instructions), and the book focuses more on what the people discover about themselves in the journey (which lasts weeks at least) to this mysterious end goal. I remember it as "a sci-fi sort of Pilgrim's Progress" (minus the heavily religious overtone), because all the different places/challenges they do are supposed to represent some real-life problem someone in the group was facing. In the end, those that make it are returned to Earth with their memories wiped, but their bad habits gone. For some reason I thought the title was "The Crystal Arches" for a long time, but I haven't had any luck finding it by that title. Possibly their end destination was a set of crystal arches or something. I've asked this on a couple other internet sites but haven't had any luck. I didn't think to try here until I saw other questions like this. 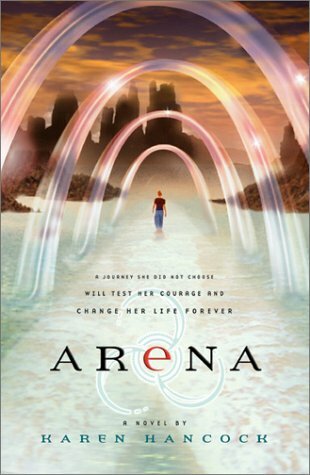 As per eee's deleted answer, there's a decent chance that this is Arena by Karen Hancock. It does involve a young woman who enters into a study and finds herself transported to an alien world and subjected to tests. 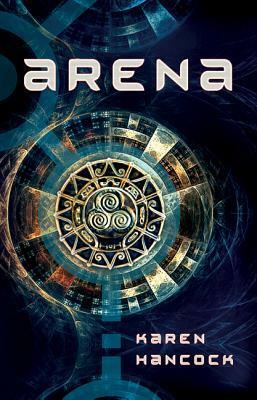 Callie Hayes finds her life in peril after agreeing to participate in a psychology study, where the examiners cast her into an alien world called the Arena, with only a guidebook and a few supplies to help her return home. At least two of the reviews on Goodreads mention the comparison to Pilgrim's Progress and several note that they didn't realize it was religious allegory until near the end. There is a Garth in her group, but the more prominent character is a mysterious man named Pierce, who has been there for longer and serves as a guide to her. And in this book, it's phobias they're trying to overcome, not bad habits. Callie is afraid of heights, for example. Overcoming those fears is central to their success. Not the answer you're looking for? Browse other questions tagged story-identification books aliens or ask your own question. Help! Book With Meat-eating Alien Horses?